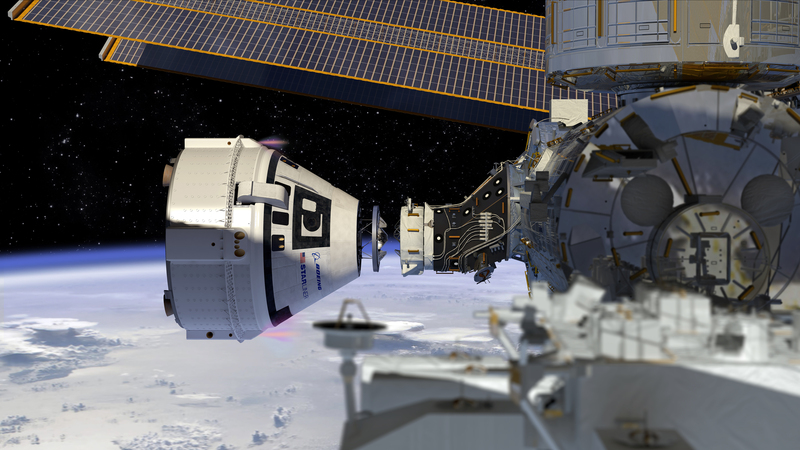 NASA is preparing to name a batch of astronauts who will fly the first-ever commercial spaceships: the CST-100 Starliner built by Boeing and Crew Dragon built SpaceX. But the agency is staring down a real possibility that it might not be able to send people into space after next year. That risk likely increased after Boeing discovered a problem in a new spacecraft system the company designed for NASA. The issue — a fuel leak — appeared on June 2, as Ars Technica first reported , when Boeing test-fired four thrusters designed to propel the Starliner away from a potential launchpad emergency. “Our team is off fixing those problems, and the result of that test series is that we will have a better and safer spacecraft,” John Mulholland, Boeing’s vice president and Starliner program manager, told reporters during a call on Wednesday. Search-and-rescue teams with NASA, Boeing and the U.S. Army hustled to assist an imaginary crew out of an inflatable space capsule at the White Sands Missile Range in New Mexico during a simulated recovery of Boeing’s new commercial crew vehicle in June. Before Boeing can start launching crews to the International Space Station in its sleek new CST-100 Starliner, the company must perform a series of tests to make sure the spacecraft can safely transport astronauts to and from space. One of those tests involves a spacecraft simulator that one might mistake for a parade balloon or an oversize pool toy. “This was actually one of our Integrated Systems Verification Tests, or ISVT,” Boeing spokesman Josh Barrett told Space.com via email. Boeing announced today that the uncrewed test flight of its CST-100 Starliner commercial crew vehicle will slip to the end of 2018 or early 2019, and the crewed test flight will not take place until mid-2019. Both had been scheduled to take place this year. NASA is anxious for the Boeing and SpaceX commercial crew systems to begin operations because its access to Russia’s Soyuz spacecraft ends next year. NASA has had to rely on Russia for taking astronauts to and from the International Space Station (ISS) since the space shuttle was terminated in 2011. President George W. Bush directed in 2004 that the space shuttle program end as soon as construction of ISS was completed, then expected in 2010. The primary reason was to make the money spent on the shuttle available to execute Bush’s plan to return humans to the Moon by 2020. NASA said in a statement last week that it will name the astronauts who will fly the crewed demo flights by Boeing and SpaceX during an event Aug. 3 at the Johnson Space Center. The event will also announce the crews for the first post-certification missions by each company, which will mark the start of routine transportation of astronauts to and from the station by Boeing’s CST-100 Starliner and SpaceX’s Crew Dragon. US aerospace giant Lockheed Martin could bring their electron rocket to the proposed site at the A’Mhoine peninsula, on the Melness Crofting Estate near Tongue. Vertical rocket and satellite launches are planned and the UK Space Agency says the move could pave the way for spaceflights at the remote spot. The electron rocket currently flies out of New Zealand from a peninsula in the country’s North Island, and environmental groups there previously highlighted concerns about the impact of chemicals, including kerosene, being released into the ocean by these rockets. Nine astronauts have new travel plans aboard commercial space capsules, with their mission assignments announced earlier today (Aug. 3). Five of those astronauts flew aboard the United States’ last set of spacecraft to travel to the International Space Station (ISS), the space shuttles. But while the newly announced crews are excited to once again launch from Florida instead of Kazakhstan, they aren’t very nostalgic for the hardware of the shuttles themselves. During the press announcement of the new astronaut assignments, NASA Administrator Jim Bridenstine asked two veteran astronauts to compare their new rides to the shuttles they flew more than seven years ago. The first group of American astronauts who will fly to and from the International Space Station from U.S. soil in nearly a decade all served as military officers. Eric Boe, Christopher Ferguson, Nicole Aunapu Mann, Robert Behnken, Douglas Hurley, Josh Cassada, Sunita Williams, Victor Glover and Michael Hopkins hope to usher in a new era of American space travel. They’ll head to space in aircraft that weren’t designed by NASA. The astronauts will fly the first test flights and missions in two American-made, commercial spacecraft: Boeing’s CST-100 Starliner and SpaceX’s Crew Dragon. NASA has worked closely with the companies throughout design, development and testing to ensure the systems meet the agency’s safety and performance requirements, according to a news release. This week Bridenstine visited Johnson Space Center for the first time as administrator. On Friday, he will unveil the first astronauts that will fly into space on board the Boeing Starliner and SpaceX Dragon commercial crew vehicles in about a year. As part of the visit, he also answered questions for an hour from a handful of media on Thursday. Ars pressed Bridenstine on why things would be different from past failures to return astronauts to the Moon or go on to Mars. The International Space Station’s crew sent a Dragon back to Earth today, filled with more than 3,800 pounds of scientific samples and equipment. SpaceX’s robotic Dragon cargo capsule had been hooked up to the station for just over a month, providing plenty of time for the crew to unload shipments from Earth and then load it back up for the return trip. Among the payloads were an experiment aimed at finding out whether algae grown in zero-G could produce high-value compounds, and cell samples for a study focusing on cancer treatment. After splashdown in the Pacific, the Dragon was to be hauled onto a recovery ship for its return to shore. The Dragon’s return came just hours after NASA announced the first crews for a Dragon 2 spaceship that SpaceX is testing. In medium Earth orbit, the only system providing satellite broadband today is SES Networks’ constellation of 16 O3b satellites. A British startup with its own 16-satellite constellation idea wants to change that. Methera Global Communications estimates it needs $500 million to build and launch a constellation of satellites each equipped with 40 gigabits of capacity to beam down Ka-band connectivity to highly concentrated areas. If successful, Methera will launch its first spacecraft in 2022, with service starting that same year. Two factors explain why Russian women seldom fly to space – national mentality and subjective low self-esteem, the chief of a section at the Russian Academy of Sciences’ Institute of Biomedical Problems, Mark Belakovsky, told TASS on Thursday. Earlier it was announced that more than ten aspirants had gone through the full cycle of selection for the team of Russian cosmonauts but there were no women among them. “There are no obstacles to women’s space missions from the physiological point of view. I believe there are two hindrances that can explain why there are no Russian women among the crewmembers of the International Space Station: national mentality and subjective low self-esteem,” Belakovsky said. Humans have big dreams of setting foot on another planet. But before we do, we’ll need to figure out how to keep our germs to ourselves and how to protect ourselves from the life we may find there. That’s the mandate of planetary protection, and experts in the field are already developing guidelines for human missions that will visit potentially life-supporting locales, like Mars. One of those scientists is Julie Mitchell, the planetary protection officer at NASA’s Johnson Space Center in Houston, who said now is the time to figure out those rules. “We have to make sure planetary protection is included from the very beginning, which means now,” Mitchell told Space.com. The moon and the word “astrobiology” don’t often appear in the same sentence—even with a handful of government space agencies and private corporations planning crewed forays to the lunar surface for the first time since NASA’s Apollo 17 mission in 1972. That final Apollo lunar landing took place after it became clear the moon was lifeless—a shift from the initial landings, which subjected their crews to quarantine after returning to Earth. Those early precautions, now called “planetary protection,” were meant to prevent back contamination—the potentially catastrophic introduction of extraterrestrial organisms to Earth’s biosphere. But by the end of the Apollo program, moon-walking astronauts were only quarantined prior to leaving Earth, simply to ensure they were not incubating an infectious disease that could manifest during their high-risk missions. Russia has signed a deal to sell previously banned space rocket engines to the United States at a time of heightened tensions between the two countries. U.S. lawmakers banned the use of the Russian engines for military and spy satellite launches after Moscow annexed the Crimean peninsula in 2014. The ban was partially lifted due to the United Launch Alliance (ULA) space contractor’s reliance on the Russian-built engine for lifting its rockets into space. “We signed a contract where we will supply six more RD-180 engines to our partners in 2020,” the head of Russia’s Energomash enginemaker, Igor Arbuzov, told the state-run RIA Novosti news agency on Tuesday. NASA was officially born 60 years ago yesterday when President Dwight D. Eisenhower signed legislation bringing the agency into existence on July 29, 1958. The decision came after Soviet successes with the Sputnik program sparked concerns in the U.S. that American efforts in space were coming up short. The new administration was built on the framework of an existing agency, the National Advisory Committee for Aeronautics (NACA), with legislation laying out eight primary goals for NASA. “There are no blueprints or road maps which clearly mark out the course,” Lyndon B. Johnson said at the time, in his role as Senate majority leader and chairman of the Special Committee on Space and Astronautics, according to a video released by NASA to commemorate the anniversary. But the freakout is wrong. Digging into the meteor incident demonstrates that it really isn’t that big of a deal. Here’s why. First, “The energy that came in with this was very limited,” Hans Kristensen, director of the Nuclear Information Project at the Federation of American Scientists, told Task & Purpose. Spaceport Colorado is a commercial aircraft operation looking for a horizontal launch license. We met with Ken Buck Representatives Erika Chaves and Cody LeBlanc who started off the listening session in Burlington. Those in attendance were then able to meet Dave Ruppel, airport director out of Adams County. Those who are a part of Spaceport Colorado have produced a vehicle meant to be launched into suborbital space. The vehicle is the same size as a medium business jet. It takes off just like any other commercial flight, but then produces two sonic booms, to help get it in and out of suborbital space. While up in space they pick the angle for re-entry, and head back toward earth with the second sonic boom. It would turn a flight from Denver to Tokyo into an hour and a half flight! Amazon.com founder Jeff Bezos is racing to pull his private space company out of start-up mode and move into production amid signals that his firm’s heavy rocket set for lift-off in 2020 may slip behind schedule, according to people familiar with the project. After years of planning, NASA is finally launching a new effort to send astronauts back to the moon and then onward to Mars. The space agency is developing a new capsule spacecraft, a super-heavy rocket to boost the capsule into space, and a moon-orbiting station that, if it deploys on schedule in the mid-2020s, could serve as humanity’s main waystation for ever-longer missions farther into the solar system. But one important piece of technology is missing: a new space suit. Fifty-three years after astronaut Ed White stepped outside his Gemini 4 capsule on the first-ever spacewalk for an American, NASA is stuck using decades-old suits that critics say are too old, too bulky, too rigid, and too few in number for America’s new era of space exploration. “I would expect to do any type of work and take the same responsibility as any Chinese astronaut in CSS (China Space Station),” said Matthias Maurer, a German astronaut. Maurer wishes he could work in CSS one day. At the European Astronaut Center (EAC) under European Space Agency (ESA), located near the West Germany’s city of Cologne, Maurer told Xinhua about his expectations for CSS. “I want to participate in both European and non-European experiments there. Also (to) build a live video connection so that the European public can talk with the European astronauts in the CSS and see inside,” Maurer said. Before joining the ESA in 2010, Maurer has already boasted rich international experience by studying and working in various countries including Germany, France, Spain and Britain. The Senate Commerce, Science, and Transportation Committee approved the Space Frontier Act, S. 3277, this morning on a voice vote with no debate. Three amendments were adopted: a Cruz amendment in the nature of a substitute; an Inhofe amendment regarding spaceports; and a Peters amendment on space debris. The next step will be a vote by the full Senate. The bipartisan bill was introduced last week and is sponsored by Senators Ted Cruz (R-TX), Bill Nelson (D-FL) and Ed Markey (D-MA). The two main topics are commercial space regulations and extending the lifetime of the International Space Station (ISS) to 2030. NASA Administrator Jim Bridenstine is in the process of visiting all of the NASA facilities across the country. On Thursday, he visited Johnson Space Center. On Friday, he will join NASA leaders to announce the first NASA astronaut crew assignments for the commercial crew vehicles. On June 18, 2018, in Washington, D.C., President Trump announced the development of a U.S. Space Force to “ensure American dominance in space.” The Space Force is to form a sixth branch of the U.S. military. On the same day, the UNISPACE+50 celebrations began in Vienna. Hosted by the United Nations Office for Outer Space Affairs (UNOOSA), participants marked half a century of UNISPACE, the UN Conference on the Exploration and Peaceful Uses of Outer Space. UNISPACE was first held in Vienna in 1968, following the passing in 1967 of the Outer Space Treaty—full name, the Treaty on Principles Governing the Activities of States in the Exploration and Use of Outer Space, Including the Moon and Other Celestial Bodies. That’s right. A new report by NASA’s Office of Inspector General raises doubts about the feasibility of NASA’s plans to transfer ISS operations to the private sector in 2025. In a report published July 30, the office also warned that NASA’s research goals may not be completed by 2024 as expected, requiring additional time on the ISS or another facility in order to meet the agency’s deep space exploration requirements. The report was skeptical of plans, announced in the agency’s fiscal year 2019 budget proposal in February and a transition report submitted to Congress in March, to end direct federal funding of ISS operations in 2025, transferring all or part of it to the private sector in a bid to save money and support the commercialization of low Earth orbit. On July 5, the Indian Space Research Organisation carried out a technology demonstration that holds key to prospects of a manned mission to space. According to ISRO, this crew escape system is an emergency escape measure designed to quickly pull the crew module along with astronauts to a safe distance from the launch vehicle in the event of a launch abort. This test was first in a series conducted by ISRO which qualified the crew escape system. In all manned missions to space, the crew module—container that houses astronauts—is installed on the rocket’s uppermost stage. ISRO’s latest test, called pad-abort, checks whether an escape system installed on the crew module can take it away to safety should the rocket malfunction on the launchpad itself. If private companies are going to start exploring and settling the final frontier — building human outposts on the moon and Mars, launching tourists into space or even building luxury space hotels in orbit — the world will need clearer laws to govern the commercial use of space and more specialized attorneys to understand and interpret those laws. The world already has several treaties that govern what government entities can and cannot do in space, like the United Nations’ Outer Space Treaty. However, private companies don’t necessarily have to abide by the same rules. We need law schools to prepare students for this infinite realm of property law regarding physical property, like the construction and use of spacecraft, space stations and even to attempts to colonize the moon and Mars. That preparation also extends to the vast universe of intellectual property. In the near future, sending military cargo in and out of space may not only be the realm of science fiction and fantasy pop culture like Star Trek and Star Wars. For better or worse, the idea of an independent Space Force seems to be gaining traction within the White House, in Congress, and even the halls of the Pentagon. The Air Force stands to lose the most in any such arrangement, so, perhaps not coincidentally, some members of the service’s senior leadership seem especially keen to show that they understand that space, and potential threats to American assets up there, is an important issue. But some of the statements these individuals have made, including the idea of prepositioning supplies in geosynchronous orbit or preparing to monitor activities in other galaxies, are highly unrealistic and difficult to view seriously. Retired NASA astronaut and commander of the International Space Station Scott Kelly ripped Donald Trump’s proposed military “space force,” calling it a waste of money that could jeopardize peaceful space exploration. President Donald Trump wants a Space Force, a new military service he says is needed to ensure American dominance in space. But the idea is gaining little traction at the Pentagon, where the president’s defense chief, Jim Mattis, says it would add burdensome bureaucracy and unwanted costs. We all know the Russians often make use of a certain ruthlessness in some of their encounters with foreign diplomats. Think Molotov. Think of the threats by Russian Foreign Minister Sergey Lavrov and Vladimir Putin that they would take military action against Sweden if it had the temerity to try and join the NATO alliance. Russia has behaved in much the same way on space and related military issues, including on the efforts to create international standards for conduct in space, as Frank Rose, former assistant secretary of State for arms control, verification and compliance, told an audience here at the annual deterrence conference put on by Strategic Command. More than three decades ago, one of the most complex Space Shuttle science missions ever undertaken hung—for the merest of seconds—on the knife’s edge between success and failure, some 67 miles (108 km) above Earth. Heading into orbit at more than 9,300 mph (15,000 km/h) on the afternoon of 29 July 1985, Challenger was in the process of launching seven astronauts and the Spacelab-2 payload of telescopes and astronomical instruments for seven days of round-the-clock science. Three weeks earlier, on 12 July, the Mission 51F crew of Commander Gordon Fullerton, Pilot Roy Bridges, Mission Specialists Karl Henize, Story Musgrave and Tony England and Payload Specialists Loren Acton and John-David Bartoe had endured a hairy on-the-pad engine shutdown, seconds before liftoff. Their second attempt to reach space would prove successful, but today stands as one of the most significant near-misses in the shuttle’s program’s 30-year lifetime. A Russian scientist from the Central Research Institute of Machine-Building, Viktor Kudryavtsev, who was detained last month in Russia on high treason charges, was allegedly involved in sharing top-secret data with a NATO member state, his lawyer Yevgeny Smirnov told TASS citing investigation case materials. Last Wednesday, investigators pressed high treason charges against Kudryavtsev, a scientist with the Central Research Institute of Machine-Building (TsNIImash, the parent research institute of Russia’s State Space Corporation Roscosmos). “According to the investigation case materials that we have, Kudryavtsev had been allegedly handing over classified information to one of the NATO member-states,” his lawyer Yevgeny Smirnov told TASS. In the introduction to Limiting Outer Space, editor Alexander C.T. Geppert quotes the late historian Tony Judt, who called the 1970s “the most dispiriting decade of the twentieth century.” That seems like a bit of hyperbole, given that earlier decades of the century gave us two of the bloodiest wars in human history, a major economic depression, and the rise of fascism and communism. The 1970s gave us Watergate, stagflation, malaise, and disco: not exactly uplifting, but dispiriting on a different scale from the events earlier in the century.